SE1 Picture Frames is based in South East London SE1. A two minute walk from Bermondsey Street and just off Tower Bridge Road. Please contact us to book an appointment. We are usually on site but to avoid disappointment and to allow us plenty of time to discuss your project with you please contact us and book an appointment before you set off. If you would like an idea of the price of a project then please email us with the specifications that you have in mind. Please be aware that an accurate quote is usually only possible once we have seen the art work and discussed all possibilities with you. Our standard framing is to conservation standards and this will be reflected in the quote unless otherwise specified. On arrival please report to security. 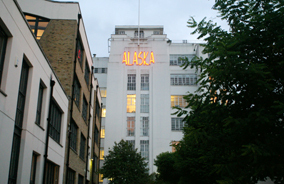 Bus – Number 1 and 78 both stop outside the Alaska Buildings. On arrival please report to security at the front desk who will tell you where to go.